Live Industrial presents the BEL 507, an extremely compact Semi-Automatic Tilting Case Former and Pack Station ideal for packaging solutions on manual case packaging lines in the packaging industry. The BEL 507 is designed to achieve better ergonomics when the case is tilted towards the operator, such as tall cases become easier to pack and unstable objects and subjects to tipping are easier to load. Bagged products, such as foods, must be packed in a vertical position to prevent product damage. 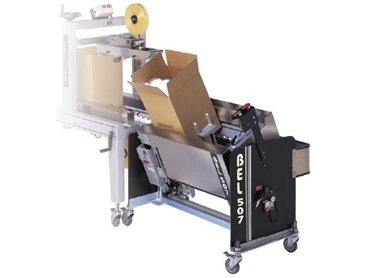 When the BEL 507 is connected to any BEL case sealer, also available from Live Industrial, this creates packaging systems that allows one individual to form, pack and seal corrugated cases in a single operation. Simple one-minute case size change over. No tools necessary. Dynamic flap-folding system power folds al bottom flaps. Pneumatic major flap “pre-openers” keep bottom flaps aligned for trouble-free folding. Positive mechanical case hold down keeps box in place for hands-free case loading. Erected cases are positioned on roller deck for easy transfer to case sealer. Three point switch actuation protects against accidental startling. Can be easily connected to any BEL case sealer. Corrosion resistant construction, attractive stainless steel covers and no painted surfaces aid in easy maintenance. The BEL 507 Semi-Automatic Tilting Case Former and Pack Station, from Live Industrial, helps improve productivity and eliminates the extra labour needed to setup and close case bottom flaps prior to loading.